WASHINGTON (CNN) -- The U.S. military will stop publishing the number of Taliban and insurgents it kills in Afghanistan under orders from the senior U.S. military spokesman for the American-led coalition. 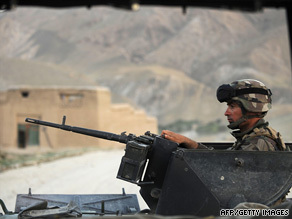 A French soldier mans a gun Sunday during maneuvers in Afghanistan's Kapisa province. Rear Adm. Gregory Smith ordered the change as part of the new military strategy in the war that focuses on protecting Afghan citizens rather than killing militants. "Indicating the number of insurgents killed has little relevance to impacting the lives of Afghans. In fact, if that were the only purpose and metric, you would likely only extend the time it takes to bring about an end to the insurgency," Smith said in an e-mail to CNN responding to a query about the change. The issue of publishing enemy body counts has been extremely sensitive to the U.S. military since the Vietnam War when the military regularly published large enemy body counts but seemed to be failing overall to make progress in the war. In the wars in Afghanistan and Iraq, the Pentagon has shifted policies several times, both publishing numbers in news releases on particular engagements and firefights and also declaring it would not publish body counts. In the past some military officials have said the numbers have been part of individual releases to the media as a means of demonstrating success against enemy forces. Smith said, "We conduct operations not aimed at killing insurgents, although in many instances that is the outcome, but to over time clear areas of insurgency and give the people a chance to reconnect with official forms of governance and to rebuild their lives, socially and economically."